It could be make it or break it time for Bitcoin. A technical measure that analysts who rely on historical price patterns to make their assumptions suggests that Bitcoin is on the brink of a large move. Whether it mirrors the 1,400 percent surge in 2017 that catapulted the cryptocurrency into the mainstream or the subsequent 74 percent decline last year remains in question. 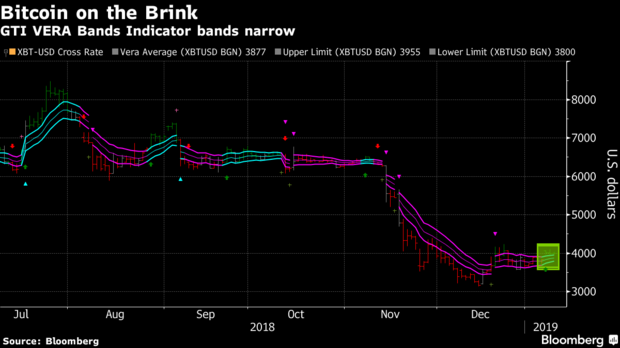 The narrowing of the upper and lower bands of the GTI VERA Bands Indicator suggests Bitcoin, which in its longest buying trend since September, is on the verge of a breakout. The virtual currency has been hovering around its key level of $4,000 and is up about $900 since its trough on Dec. 14. Either way, investors remain cautious. “It’s unlikely that the bottom is in for Bitcoin,” said Travis Kling, founder of the crypto hedge fund Ikigai. “I am certainly willing to change my mind, but the preponderance of evidence leads us to believe that we’ll see more lows before we head higher."